Yesterday was my first time out standing on a street corner with the "Are You Ready" cross. I got home from work, loaded the cross into the trunk of my car and drove to the corner of Ortega and Camino Capistrano in San Juan Capistrano. I sat in the Starbucks across from the corner and read my bible while enjoying a tasty iced latte. After reading several chapters I began to pray that the Lord would bless my time out with the cross. I had no idea how this was going to go and was nervous! In fact, I may have been even more nervous than the first time I open-air preached! I "tweeted" a quick update to twitter asking for my brothers and sisters in Christ to pray for me and then headed back to my car to get the cross and my evangelism backpack. I got the cross out of the trunk, hoisted it up and began to walk toward the corner. I said hello to a couple who were hanging out on a park bench and they just stared as I walked past. 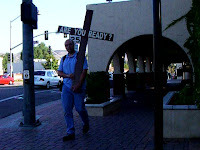 As I walked down the sidewalk toward the street corner I could see drivers looking up at the "Are You Ready" message on the cross. I crossed the street and turned and faced the traffic and felt very conscious of the eyes that were now staring at me and the cross. I continued to pray that the Lord would use the "Are You Ready" message to cause people to think about eternity. I was also praying that the Lord would confirm to me that this "method" of evangelism is valid. During the first several minutes I experienced a full range of responses from the motorists who drove by. Some stared at the "Are You Ready" message, some honked, some nodded, some gave an enthusiastic thumbs-up, some shook their heads, and some laughed at me (nobody hollered or cursed at me and I was very thankful for that!). I thought about Tony Miano saying that he experienced a new level of identifying with Christ in holding the cross for all to see and I too experienced this new sense of identification with my Saviour. I listened to the audio. I'm choking back the tears. How wonderful! God is SO good, that He would use your first time out with the cross to draw Jordan to you to hear the gospel! What a blessing for both you and, especially, him. I'll be praying for you in your continued ministry. And I'll remember Jordan as well. Great audio! What a great conversation Jeff. You had a very calm voice and related to him very well. You were right smack in God's perfect timing for that man. Way to be faithful and obedient. Keep up the good work in the Lord!